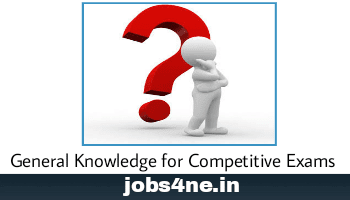 General Knowledge for Competitive Exams- UPSC/ State PCS/ SSC/ Defence/ Banking/ Insurance- 01. - Jobs4NE : Jobs in Assam and North East India. General Knowledge for Competitive Exams- UPSC/ State PCS/ SSC/ Defence/ Banking/ Insurance- 01. 1. Which of the following term is used for a “school” of learning and teaching the branches of Vedas? 2. What fraction of Rajasthan’s total area is covered by Thar Desert? 3. The Sankosh river forms boundary between which of the following two states? 4. Which of the following is not the name of a foreign bank? 5. Which of the following days is observed as the International Day for Tolerance? 6. Who among the following is the current Chief of National Security Guards? 7. Hathigumpha inscription gives account of which of the following rulers? 8. The place Dharanikota in South India is related to which ancient dynasty? 9. In which of the following regions, maize is used as staple food ? 10. Where is the National Commodity and Derivatives Exchange Limited (NCDEX) located?